There are so many choices these days when it comes to plant-based burgers, it’s never been easier to go meatless during grilling season. One of my current favorites is Gardein’s Ultimate Beefless Burger. It tastes great! It’s savory and kind of beefy, and it also has a “meaty” texture which I enjoy. I love it with tomato, onion and arugula. This was yummy and very filling. Also easy to prepare. Plant-based burgers or veggie burgers have come a long way over the past 2 decades. I remember when I first went vegan how bland most veggie burgers were, and there was little choice. Now there’s a plethora of options. The Beyond burger, another one of my favorites, tastes beefy to the point that some non-vegans are fooled into thinking it is beef and some vegans find the beefiness disturbing or unpleasant. I think the Gardein burger is nearly as good as the Beyond burger, which is typically pricier. What is your favorite plant-based burger? Or do you prefer to make your own? If you prefer making your own, please share your favorite recipe! Nearly two weeks ago I completed the Paine to Pain trail half-marathon, my second official half-marathon. It wasn’t that much different from last year except that I didn’t juggle this time and it was warmer and it rained a little. Obviously, not juggling is part of the reason I completed the race in 1:50, 11 minutes faster than last year. However, I did juggle while training, and even did a little joggling while warming up before the race. It seems not juggling during this race disappointed some spectators who had expected me to juggle. I really love this race. It’s so steeped in history and celebrates Thomas Paine, one of the few Founding Fathers strongly opposed to slavery, among other progressive stances. This was the 10th anniversary of the race, it has become something of a New Rochelle tradition. So why didn’t I juggle this time? I was concerned about having a mishap on the narrow, rocky trail, but I also wanted to see how much faster I would be without juggling. Though I didn’t fall last year, I did drop the balls 4 times and came close to spraining my ankle. This year I did trip a few times but didn’t fall to the ground since I quickly regained my footing. The race started at 9, but since most of this race takes place on a rocky, narrow trail there are different waves that start at different times. I was in wave 3. Much of mile 1 was on the street, but once you’re on the trail it is wickedly rocky and hilly. I took it easy for the first few miles, but after this started passing a lot of runners whenever the trail allowed for it. Even when I’m not joggling, I’m joggling: My arms still automatically make a juggling motion while running because they’re so used to juggling while running. This is hardly a problem and fortunately nothing trains you to have perfect running form more than joggling. For this reason, adding joggling to your training regimen may prove beneficial even if you don’t plan on doing it at races. I’m not sure if all the unicycling I do helps with form or balance while running, but it probably helps push my cardiovascular fitness to the max without having to worry about a running overuse injury. Several miles in, the crowd of runners thins out and I started picking up the pace. This big, rocky hill in Saxon woods slowed me down a little, but I continued to pass more runners. In some parts of the woods the summer greenery is holding out, but in others the dazzling reds, oranges, and yellows of autumn are working their magic. Midway in I felt terrific. I was wet both from my sweat and from the drizzle, and I was still getting faster. Approaching Twin Lakes I was in very familiar territory, I could almost run it blindfolded. Then next thing we know, the finish line is only 2 miles away, and I grab my last cup of water from the aid station. I went all out until the end. My fastest mile was mile 12, a 6:56/mile pace; although my legs felt strong and I felt great otherwise, I felt a little nauseous running so fast. Average pace for the entire race was 8:13/mile. It felt a little awkward crossing that finish line without juggling but what a glorious feeling it was. My recovery is going well so far. Representing Team Humane, any support is appreciated. One silver lining of all the nasty weather we’ve been experiencing lately is that I have more time to bake. Everyone who knows me knows I love blueberries, so what could be better than baking my own whole grain blueberry muffins that are not only perfect for breakfast but also a great snack? The combination of blueberries and a little maple syrup makes these just sweet enough to be enjoyable by most, though probably not sweet enough to be a dessert treat. A good source of protein, fiber and so fruity and spicy, they’re a great way to start the day. Combine all wet ingredients into 1 bowl and mix thoroughly, adding blueberries last(for this recipe I made a puree of about half the blueberries with my blender and the rest were whole, but this is optional). This should be enough to make 10 large muffins. Feel free to add a little more spice if you like muffins extra spicy. To make them even tastier, you can add vanilla if you want. Similar recipes I’ve seen also include lemon or orange zest(or even orange juice or apple juice), or even apple cider vinegar, all of which I see as optional. The batter consistency should be thick, but if you find it a little too thick and hard to work with, add a little more soy milk. If it’s too liquidy, add more flour. These came out better than expected though I think I’ll add more spice next time. Enjoy! The Paine to Paine which took place this past Sunday was my first time ever running or joggling an official half-marathon or trail race. An almost, but not quite, new experience for me. This is also my first official race since I injured myself at the Yonkers Marathon last year(it totally healed). As a marathon joggler, I figured a half-marathon should be easy; for the most part, it was. The real challenge of this race is that much of it is an obstacle course of tree roots, jagged rocks, and hilly twists and turns. Good thing I often train on trails! So I awoke at 6:15 the day of the race, well-rested and ready to take on the trails. I slept really well, and wasn’t nervous at all the night before, unlike how I slept the night before the Yonkers marathon last year. I had my usual breakfast of Weetabix with raisins and sunflower seeds, put on my running attire, grabbed my balls, and I was out the door. Though the race started at 9:00, I wanted to get there extra early, no later than 8:30. Some people I ran into before the start were shocked over the idea of joggling a trail race. “Seriously, you’re actually going through with this?”, they would ask. “Joggling a road race is difficult enough, but a trail race, come on!”, is another common remark. The race is called the “Paine to Pain” because it starts at the Thomas Paine cottage in New Rochelle, New York and well, the other “pain” is pretty obvious to anyone who has run it. It is a loop course that goes through several different towns on the Colonial Greenway, of which the Leatherstocking trail is a large sub-section. Since Thomas Paine is a kindred spirit, I love the idea of this race starting at his cottage and being named for him. Regarded as the philosopher of the American revolution, he was a highly influential proponent of Enlightenment values, and was an early abolitionist. I recommend visiting his cottage in New Rochelle if you’re in the area. We couldn’t have asked for better running weather on race day. “Perfect” doesn’t begin to describe it. Clear skies and in the 50s just before the race and slowly rising into the 60s a few miles in. After months of brutally hot weather, the slight chill in the air at the beginning was more than welcome. My goal was to to complete in less than 2 hours. So at 9:00 the gun goes off and the first wave of runners is off! Since I was part of the second wave, I had to wait a minute before I could start. Finally nervous with anticipation, I go to the back of wave 2 to avoid being in anyone’s way, and before I know it it’s wave 2’s turn to start. The support at the start was pretty amazing with lots of spectators lining the streets, many of whom were surprised by my joggling. The first mile of this race is on the streets, so it didn’t feel like the race had really begun until I got to the first leg of the Leatherstocking trail close to the Larchmont border. I took it easy with the first mile, and also with mile 2. Since I’ve done this trail a few times before, there weren’t any surprises. Juggling while running over rocks and tree roots may sound ridiculously difficult to you, but with enough training it is doable. I kept myself as much to the side as possible in case anyone wanted to pass me on the narrow trail, and a lot of runners did just that. I occasionally passed some slower runners whenever the trail widened. I generally got a lot of support from my fellow runners. When things got really difficult during some steep rocky climbs, I would ask myself “why the hell am I doing this?”. I finally dropped the balls a little after mile 6 during a minor stumble. The beauty of the morning sun shining through the trees, the sweet birdsong, the earthy aroma of the forest, all while joggling over difficult terrain is an ineffably wonderful experience. Whenever the trail widened enough and there weren’t too many rocks in the way I increased my speed, often passing a lot of runners. There wasn’t much support out there except at occasional street crossings where the locals and volunteers were pretty enthusiastic. Thank you people of Mamaroneck! When I arrived in Saxon Woods, I was in very familiar territory, having run these trails countless times. After zigzagging its way through the forest and going around these giant glacial rocks, the trail widened to the point that I was able to pick up my pace and pass many other runners in Saxon Woods. I occasionally traded places with a few runners, which got kind of funny after a while. The trail then starts turning south near the Golf course where I finally got some water at around mile 8. Feeling renewed, I was able to maintain a speedy pace for a few miles, though rocks and slow runners on narrow sections sometimes hindered me. Also my left ankle bothered me a little bit at this point since I almost sprained it about a month ago. I dropped again around this point. I asked again “why am I doing this?”, and I would answer myself: “This is who I am”. At mile 11 we entered Twin Lakes Park, a place I visit so often it’s my second home. Still doing a brisk pace, I dropped yet again and felt really frustrated that time. In part this frustration was due to being so familiar with this area because of all the joggling and unicycling I have done there. Surely I should know this area like the back of my hand. Going south, the trail snakes its way under the Hutchinson River Parkway and now we’re in Nature Study Woods on the wild periphery of New Rochelle. Knowing I don’t have much longer to go before I reach the finish line at New Rochelle high school, I convince myself to push myself even more to make sure I complete in under 2 hours. I’m starting to feel a little sore, but it didn’t significantly slow me. At this point there are a few rocks here and there but they were easy to run around. Finally, we’re out of the dark woods and into the bright sunlit streets again for the last mile, with lots of spectators and cheerleaders cheering us on. I see the high school in the distance and start running like a maniac. 300 meters or so from the finish line and I drop one last time. I cross the finish line and I’m ecstatic, and so is everyone watching. I finished in 2:01:25, with an average pace of 9:16/mile. Just a tiny bit faster and I could have finished in under 2 hours(my half-marathon PR when training on roads is 1:39), but I still felt elated over my accomplishment. Though I dropped the balls 4 times, I didn’t fall once. Though I felt fatigued, I didn’t feel as bad as I normally do at the end of a full marathon. This really is a great race not just for connecting with history but for connecting with nature without having to travel too far from the big city. Some parts of the trail, particularly in Saxon Woods, take you through wilderness zones that make you feel like you are a thousand miles away from civilization. All in all this was a great race experience, even with all the drops. It definitely was a worthwhile challenge joggling a trail race. I often found it more intellectually than physically challenging; what long-term effect this may have on the brain remains unknown but I’m excited about the possibilities. A big thanks to Founding Father Eric Turkewitz for organizing this event and allowing me to joggle it. I’d also like to thank all the good-humored volunteers for making this an amazing race experience. Congratulations to everyone who completed this event, it was a pleasure running with you. Now that it is late winter with that little hint of spring in the air I decided to go joggling along the beach in Rye. The water was crazy cold and the sea breeze coming off the Long Island Sound was furious at times to the point that it would momentarily take away all my body heat, but otherwise I had a good time. A fitness routine without challenges is not a fitness routine. It is a glorious dance with the freezing water and cold wind. Indeed, this may be winter’s last dance until later in the year. Soon, the heat will be the major challenge, but until that happens I will make the most of the ideal spring temperatures. If you haven’t been doing much outdoor exercise, now is the time. I thank everyone for following me through the cold, dark winter, and really appreciated the inspiring comments. Push yourself to your limits, let your imagination be your fitness guide and above all, have a wonderful spring. 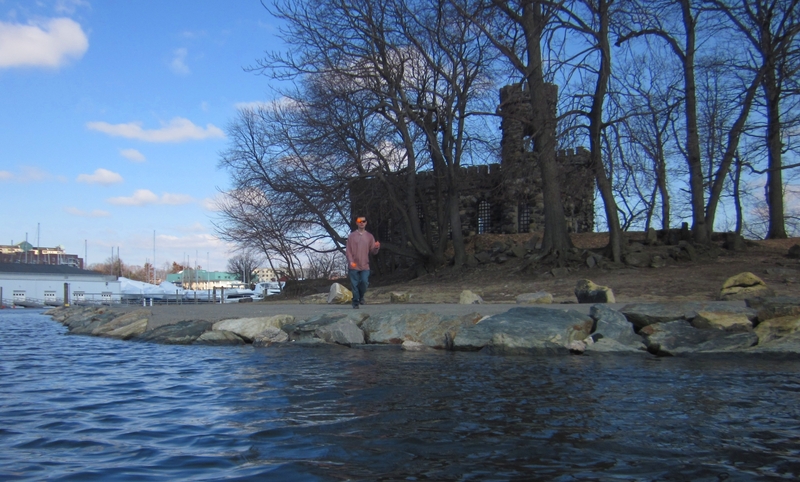 This was taken in Glen Island Park, New Rochelle, NY. The Long Island Sound is in the background. Synesthesia is a neurological condition in which the senses become blended, from the Greek “syn”, meaning “together”, and “aisthesis”, meaning “sensation”. By calling it a “condition”, I don’t mean to imply it is a bad thing. In fact, it can be enthralling to some individuals, and if they are artists can help them be more creative. In most people, the senses are separate and distinct. They hear, see, smell, taste, and feel. In a person with synesthesia, 2 or more senses can become blended, resulting in associating certain musical tones with certain colors, or associating certain smells with particular colors, or “tasting” music. There are various other interesting ways in which the senses are blended. Synesthesia is an experience in which stimulation in one sensory or cognitive stream leads to associated experiences in a second, unstimulated stream. Although synesthesia is often referred to as a “neurological condition,” it is not listed in the DSM IV or the ICD classifications, as it generally does not interfere with normal daily functioning. However, its high prevalence rate (one in 23) means that synesthesia may be reported by patients who present with other psychiatric symptoms. In this review, I focus on recent research examining the neural basis of the two most intensively studied forms of synesthesia, grapheme –> color synesthesia and tone –> color synesthesia. These data suggest that these forms of synesthesia are elicited through anomalous activation of color-selective areas, perhaps in concert with hyperbinding mediated by the parietal cortex. I then turn to questions for future research and the implications of these models for other forms of synesthesia. Since this is a very subjective experience, it is difficult to study. There is no way to officially “diagnose” it, and it’s not very common. I don’t believe I have it, but sometimes I think I experience very brief flashes of it or something similar. It’s certainly possible that synesthesia is a continuum phenomenon, meaning it may not be a simple matter of you have it or you don’t(similar to many mental illnesses, though again, synesthesia isn’t an illness). If this is the case, it means most people would fall somewhere in the continuum, with extreme synesthesia on one end and complete absence of it on the other. It sounds like it can be a wonderful experience for some people, with many artists claiming to have it. But is it possible to become a synesthete(a person with synesthesia) with training? I don’t know for sure, but it looks like the answer is no. This doesn’t mean we can’t improve our artistic abilities or our senses; synesthesia isn’t the same thing as artistic talent or artistic appreciation, but perhaps we can learn something from the experiences of synesthetes. Juggling makes me more appreciative of intricate movement and dance, but it doesn’t necessarily bring me closer to synesthesia. Still, I strive to make my juggling both more artful(by singing, humming, using different color balls, or dancing while doing it) and more athletic. The synergism between the two makes the experience far more uplifting than if I was aiming at either one of the two alone. It’s fun trying to make music with the balls, sort of like I’m a wild symphony orchestra conductor, but using balls and my arms instead of a baton. Art and fitness always together, not alone. Above all, there is so much beauty out there to appreciate, and beauty within us that needs to be expressed. Try releasing more of it next time you exercise and you may find yourself getting better results. The people in the suburbs just north of New York City who witness the strange spectacle of a man joggling probably think he is either crazy or just very serious about fitness. Of course, being crazy and being very serious about fitness aren’t mutually exclusive. Running in a blizzard is crazy, but joggling in one is even crazier. Still, you do need to be a serious athlete to do something crazy like this. Joggling in the early stages of a blizzard isn’t easy, although you may have an uncle or cousin who thinks otherwise. My State Street boots may help keep my feet dry and warm, but they are difficult to run in. My feet and knees start hurting if I try running at my usual pace in them for more than a few yards, so I’m forced to do intervals between running very slowly, and a fast power-walk while juggling. 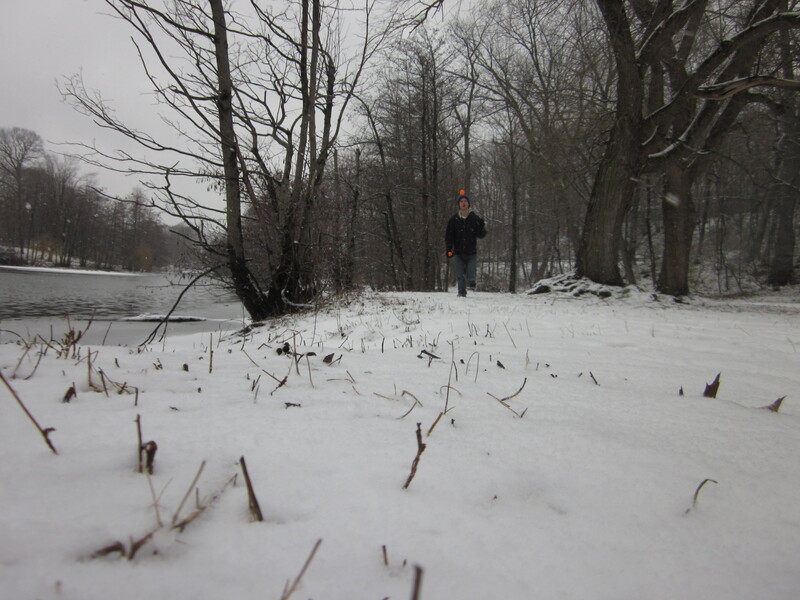 Luckily it wasn’t too cold(35 F or 1.6 C) yesterday, but the snow, which sometimes turned to sleet, kept blowing in my face. My sunglasses came in handy to protect my sensitive eyes, though they would sometimes get blurry. I did my usual route along the Bronx river, but only covered about 3.5 miles. 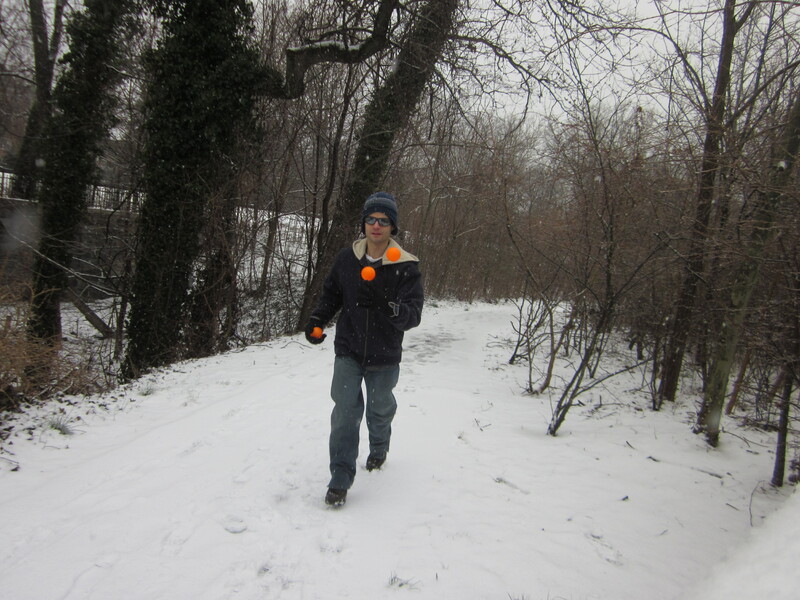 I also tried joggling with snowballs a few times. 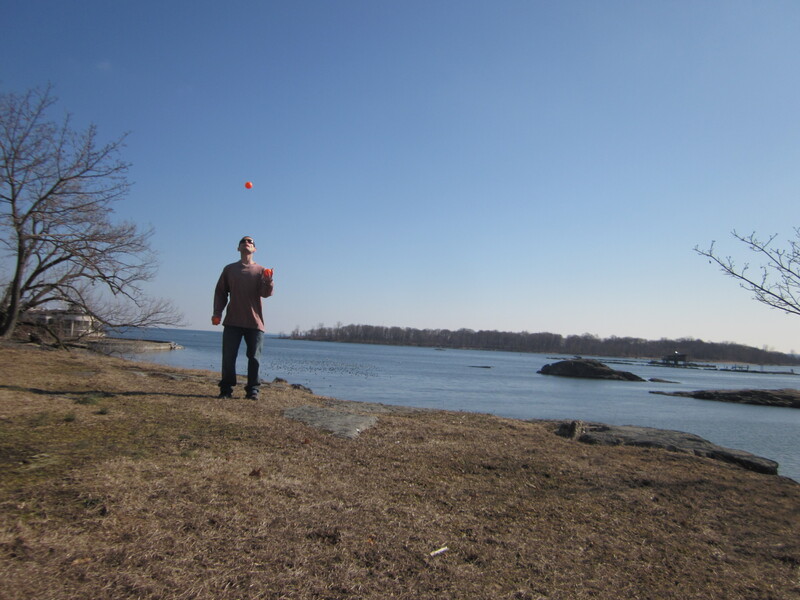 Juggling with them wasn’t especially difficult since I had heavy gloves on, but they would fall apart very quickly. I also got caught in the crossfire a few times between groups of kids throwing snowballs, but I managed to dodge all of them. All in all, a wonderful time joggling in the blizzard.